1) Duke vs. 16) North Dakota State: Will Duke’s perimeter players begin the Tournament knocking down shots? 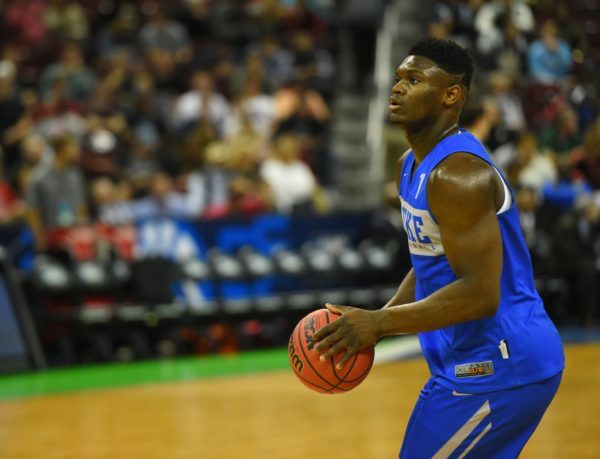 Zion will be Zion, of course, but Duke will need its other players knocking down shots down the line if the Blue Devils are to cut down the nets in Minneapolis. 1) North Carolina vs. 16) Iona: Can Iona make it to the half within closer range than last year against Duke? As a #15 seed against Duke last year, Iona trailed at the half by 14 points before going on to lose by 22. While the Gaels shot a sterling 58.3 percent from inside the arc, they were just 5-of-24 from beyond the stripe. Duke, on the other hand, shot 62.2 percent from two-point range and went 13-of-30 from behind the line. 1) Virginia vs. 16) Garder-Webb: Will Virginia be quick to rid itself of last season’s nightmare? A 29-3 regular season was great, but memories of last year will surely still be on everyone’s minds as the Cavaliers’ postseason begins. Virginia scored just nine points during the opening 10 minutes against UMBC one year ago, so its first few segments of the game will be telling. 2) Tennessee vs. 15) Colgate: Will Tennessee make quick work of Colgate? Colgate comes into this game with a defensive efficiency ranking of #202, and the Raiders will be tasked with stopping the nation’s third most efficient offense led by the force that is Grant Williams. Good luck. 3) Houston vs. 14) Georgia State: Does Georgia State coach Ron Hunter have more Tournament magic up his sleeves? On the season, Houston has out-rebounded its opponents by an average of 7.7 rebounds per game, whereas Georgia State finds itself getting outmuscled by the tune of 5.3 rebounds per game. If the Panthers can survive on the glass, the duo of D’Marcus Simmonds and Devin Mitchell might be able to keep Georgia State within striking distance. 3) Texas Tech vs. 14) Northern Kentucky: Will Texas Tech’s loss to West Virginia have any carry-over effects? While Texas Tech held the Mountaineers to just 38.8 percent shooting, the Red Raiders gave up 19 offensive rebounds and 20 points at the charity stripe. 4) Kansas State vs. 13) UC Irvine: Will Kansas State be able to get any play and production out of Dean Wade? Wade did not play in the Big 12 Tournament and his status remains up in the air for today’s game. Without the big man inside, the Anteaters could be able to take advantage of its offensive rebounding prowess. 4) Virginia Tech vs. 13) Saint Louis: How will Virginia Tech work Justin Robinson back into the lineup? After missing the last 12 games of the season, Robinson is set to return for the Hokies. The senior guard averages just under 14 points per game while shooting better than 40 percent from deep. 5) Wisconsin vs. 12) Oregon: Can Wisconsin get D’Mitrik Trice and Brad Davison to knock down open shots? In Wisconsin’s five March games, the pair of Trice and Davison have gone a combined 11-of-48 from behind the three-point line. Without knocking down open shots, Oregon will be able to throw everything they have at slowing All-America center Ethan Happ. 5) Mississippi State vs. 12) Liberty: Will Liberty be overwhelmed by the Mississippi State offense? The Flames played 14 games against an opponent with an offensive efficiency ranking of 260th or worse. The Bulldogs have an offensive efficiency ranking of 56th and are led by Quinndary Weatherspoon, who shot an SEC-best 44.9 percent on three-point attempts during league play. 6) Buffalo vs. 11) Arizona State: Will Buffalo get the best of a school from Arizona again? Bobby Hurley and the Sun Devils won on Wednesday night in Dayton and are rewarded with a match-up against Hurley’s former squad. Arizona State will need more than 23 minutes of action from Remy Martin to get another victory. 6) Iowa State vs. 11) Ohio State: With Kaleb Wesson back, can Ohio State pull off the upset? The Buckeyes lost two of their last three games with Wesson back before falling in his return to the Spartans. Ohio State averaged 10 fewer points per game on the road than they did at home. 7) Cincinnati vs. 10) Iowa: Can Iowa change its late season misfortune? The Hawkeyes come into this game losers of five of their last six games. Throw in needing a pair of last second baskets to beat Northwestern and Rutgers and it’s clear Iowa is playing its worst basketball at the wrong time of the year. 8) Ole Miss vs. 9) Oklahoma: Can Ole Miss knock down enough threes to beat the Sooners? The Rebels were just 2-8 when they failed to make a third of their three-point attempts this season. On the year, Oklahoma has held opponents to a three-point average of 33.3 percent. 8) Utah State vs. 9) Washington: Can the Pac-12’s highest seed help the conference from its dismal 2018 showing in the NCAA Tournament? The Pac-12’s regular season champion scored fewer than 50 points in two of its final four games, both coming against Oregon. The Huskies’ defense does a terrific job of creating havoc, however, led by the wizardry of defensive ace Matisse Thybulle. 8) VCU vs. 9) UCF: If VCU’s Marcus Evans is not at 100 percent, will the Rams have enough firepower? Evans suffered a bone bruise in VCU’s loss to Rhode Island in last week’s Atlantic 10 tournament. The starting guard averages a team-best 13.9 points per game and VCU could be tested greatly by UCF’s stout defense — which includes the towering presence of 7’6″ Tacko Fall. This entry was posted on Friday, March 22nd, 2019 at 8:04 am by Matt Eisenberg	and is filed under 10 questions, 2019 ncaa tournament, Regular Features. Tagged: arizona state, buffalo, cincinnati, colgate, duke, garnder-webb, georgia state, houston, iona, iowa, iowa state, kansas state, liberty, mississippi state, north carolina, north dakota state, northern kentucky, ohio state, oklahoma, ole miss, oregon, saint louis, tennessee, texas tech, uc-irvine, ucf, utah state, vcu, Viginia, virginia tech, washington, wisconsin. You can follow any responses to this entry through the RSS 2.0 feed. You can leave a response, or trackback from your own site.